The adjustable desk is exactly what it sounds like, an entire desk that can be adjusted upward or downward to accommodate the height of the person using it. A person is 6 ft. or taller. An adjustable desk can raise up to where most monitors will be high enough. Monitor arms can be added to raise up the monitors even more for those who need it. 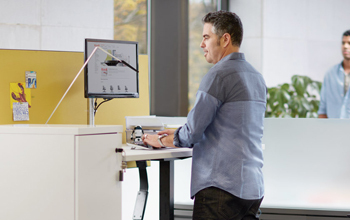 A sit-to-stand desk would get in the way of interactions. If you are a person who needs to sit at your desk and meet with others in your office, an adjustable desk allows for more flexible interaction with others. A sit-to-stand desk would be too tall. Many desks are “pieced together” by upper shelving, storage space and decorative cabinetry. There are many options for an adjustable desk. In some cases, the option of having an adjustable base added to the current desk surface can be less expensive than ordering a whole new desk. 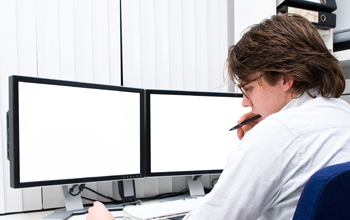 A person uses a large monitor. Adjustable desks are perfect for someone who needs to accommodate a larger monitor or television. A person needs more work space. 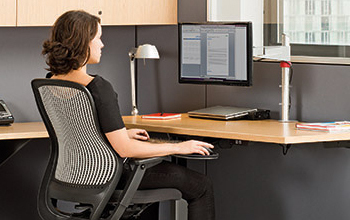 One of the most popular reasons for an adjustable desk is the space. An adjustable desk will always provide more work space than a sit-to-stand desk. An adjustable desk should fit well into your workspace, be easily adjustable without risk of physical injury, and accommodate all of your equipment. The chair must have enough height for a person to reach the keyboard and mouse and have a 90-degree angle in their elbows. Depending on the height of a person, the seat pan may need to be longer for a taller person or shorter for a more petite person. When measuring the seat pan, you should be able to fit three fingers between the front of the seat pan and the back of the knee. In order to completely relax, lumbar support is a must-have! Whether adjustable or not, most chairs offer lumbar support, but sometimes not in all the right places. It is very important to find a chair offering the most support for your back. Arm rests can be a part of relaxation. Do not use the arm rest for support while typing. They can push shoulders upward and create tension in the neck and upper shoulders. The tilt feature on a chair can offer several positions for comfort. Chairs come in many shapes. The most important aspect of a good desk is that it stands at a height where the keyboard and mouse can be reached without upward or outward extension of the arms. 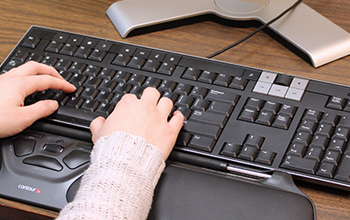 If a person is typing on a desk that is too high, they are most likely to experience upper back, shoulder, and neck pain. Having to raise and extend the arms outward puts stress on those muscles. The keyboard should fit the size of your fingers, hand and body. Small hands – A smaller keyboard. Large hands – A keyboard with larger keys. Broad shoulders – A curved or adjustable split keyboard. If the fingers are at an upward tilt and the wrist is bent, this could eventually lead to sore wrists, numbness or the beginning stages of carpal tunnel because of improper blood flow. The mouse should fit the size of your hand. If the mouse is too small, over gripping the mouse can cause fingers to cramp. 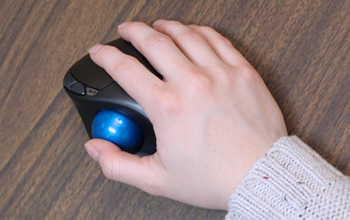 If the mouse is too wide or long, reaching for the buttons can cause unnecessary stress or pressure on the joints. If the fingers are at an upward tilt and the wrist is bent, this could eventually lead to sore wrists, numbness, or the beginning stages of carpal tunnel because of improper blood flow. Monitors should be positioned directly in front of the keyboard, about an arm’s length away and can be slightly tilted for easy reading. If you are using dual monitors, they should be centered equally in front of the keyboard to avoid twisting the neck for viewing one or the other. The height of the monitor should be at eye level or a little below. This encourages you to sit up and back into the chair and avoid leaning forward to see the monitor. If information on the monitor is shared frequently, monitor arms can be purchased to make it easier to adjust the monitor to the desired position. Monitor arms can also be used to easily bring the monitor closer to the body if you need a closer look or they can be pushed back and moved out of the way to make more room on the desktop. 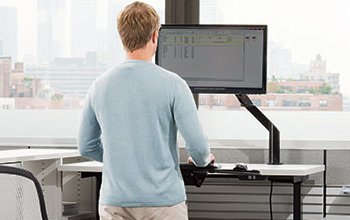 The purpose of a sit-to-stand workstation is to provide the body with an alternate way of working, other than sitting in the same position all day long. Which sit-to-stand desk is right for you? Check out our guide (PDF). When standing, use a thick foam mat for cushioning the feet. Standing for long periods of time can be very hard on the legs and feet, but a good cushion underneath can soften the tension. 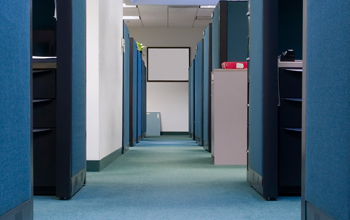 For many of us, the office environment is our second home. Creating a workspace unique to you will make you happier and more productive. Sometimes the lighting in office environments is not the best, especially to those who may be sensitive to light. If you are experiencing headaches during the day, lighting may be a possible cause. Determine if there is a glare on the monitor. Try shades on a nearby window. Inquire about removing a bulb or two from the lights above. If you are in an environment that doesn’t require a dress code, try a hat or visor to shade your eyes. Temperature plays a big role in productivity; for many, the option to change the temperature gauge in the office is not available. Wear a jacket or a blanket if you are too cold. Try a small fan if it is too warm. With so many distractions, it is easy to lose concentration and become frustrated. If you have a door, close it.